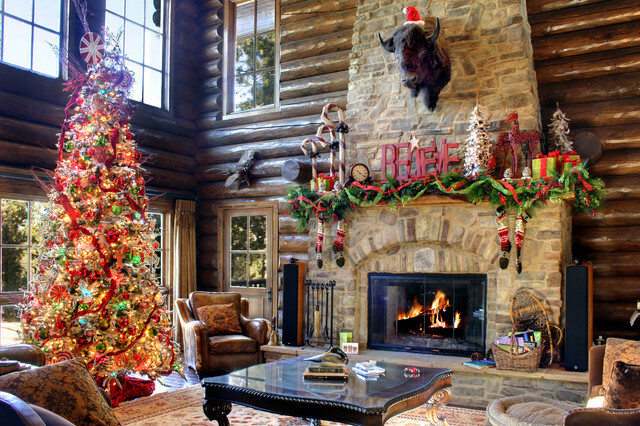 The living room, with massive floor-to-ceiling rock fireplace, boasts a 14 ft. tree decorated in a candy-land theme, and the mantle is adorned with whimsical accents. Holiday decor by Paul Nuck of Interiors. Photo by Junction Image Co.
Fair Isle stockings and a crackling fire in a log cabin set the perfect holiday scene in Big Bear Lake, California.